The Colon Community Fire and Rescue de­partment maintains 24 professionally trained firefighters, and covers a fire district of 36 square miles. The department’s equipment consists of four pumper trucks, a 3500-gallon tank truck, two four-wheel drive pick­ups for brush and grass fires, and one fully operational antique (1929) REO Pumper. In 1955, the Colon Rescue Squad started its operation with fourteen charter members. With community donations and support, it has grown to be one of the finest in the state. The rescue unit has eight emergency medical technicians and eleven first responders. The rescue truck, equipment, paved Helipad for Air Ambulance service are all made possible by community donations, auctions, and much appreciated community support and help. The rescue squad also sponsors CPR (cardiac-pulmonary-resuscitation) classes to keep the community aware of proper emer­gency treatment for cardiac victims. The department also has a auxiliary, the Co­lon Fireflies. 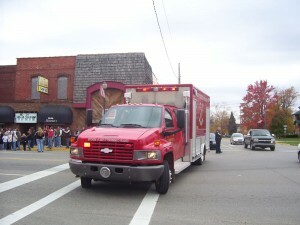 This 20-member organization assists the fire department and rescue squad with fundraising activities. Since October 1992, the Colon area is part of the county wide 911 services for emergencies. If you have an emergency, please call 911. A new fire station was erected in 2000 to bet­ter serve the growing needs of the commu­nity. The new Station is located west of the Downtown area on M86. This entry was posted in General Info and tagged Fire Dept. Bookmark the permalink.